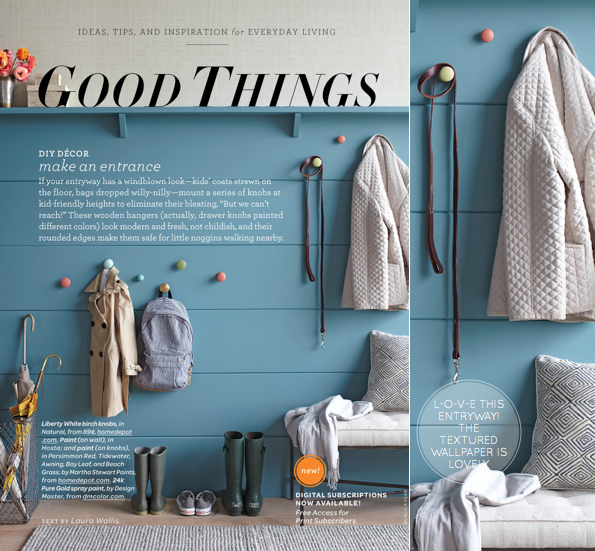 It's been a while since I've shared my favourite tear sheets with you but I loved the October issue of Martha Stewart Living so much you couldn't have gotten me to the blog any faster! Let's get down to business, shall we? First up I found myself inspired by the burnt orange flower arrangements - perfect for autumn. Next up was the children's bedroom, where the stylist used spot on accessories to style up the room (not to mention that super sweet wallpaper). Then I soon found myself dreaming of days when I might have a house to take a hallway as lovely as the one shown in the Good Things feature! 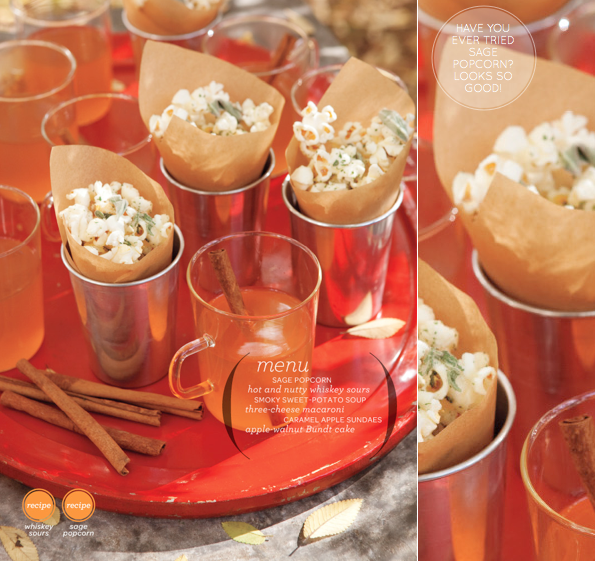 As well as the rustic-meets-opulent place setting, I also felt inspired to try out the sage popcorn recipe and the DIY bats for Halloween. 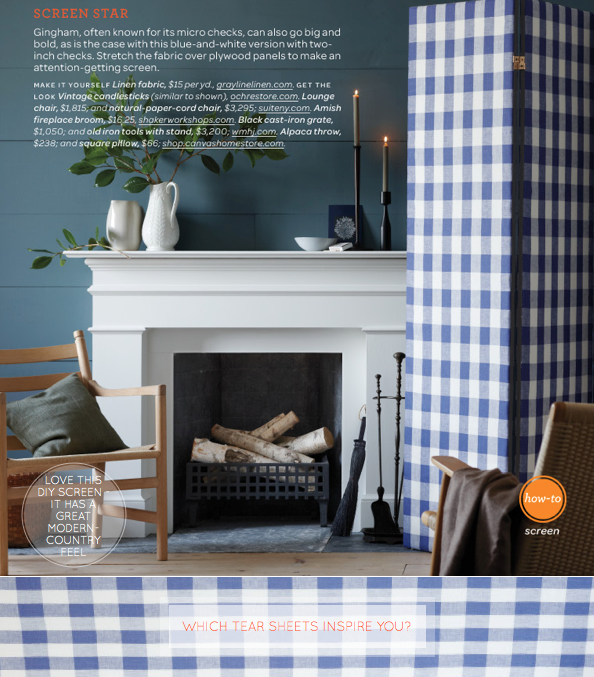 Finally, I really liked their story on decorating with check patterns - the DIY screen particularly caught my eye. So, tell me what your faves were folks? Whoa up. That jumbo crayon gives me thoughts of episodes of Full House. Fun times! 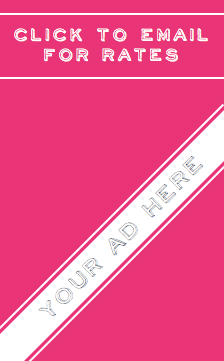 i love the cover shot- making me so hungry! That last image with the gingham is so lovely! I adore that upholstered screen! 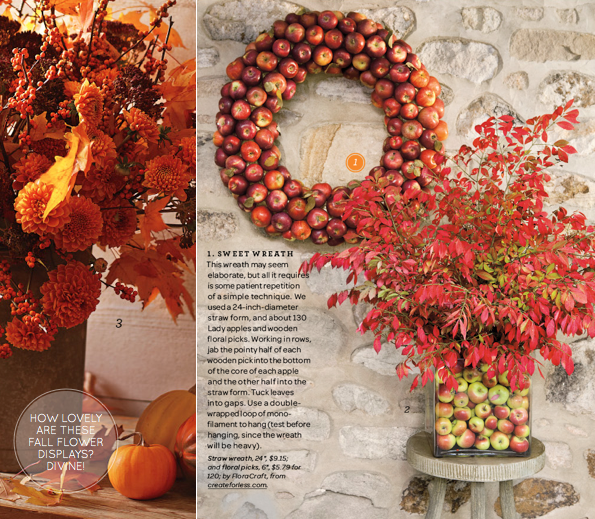 I'm really liking all the orange and red floral and apple displays esp that wreath. 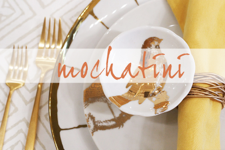 Wow I love the second lot, orange and taupe is probably my favourite ever combination! 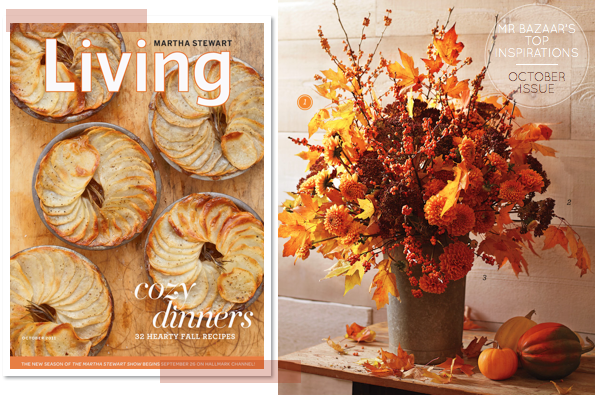 It wouldn't be fall without Martha would it?! I have to admit, looking at her magazine makes me want to get crafty and try new things out. 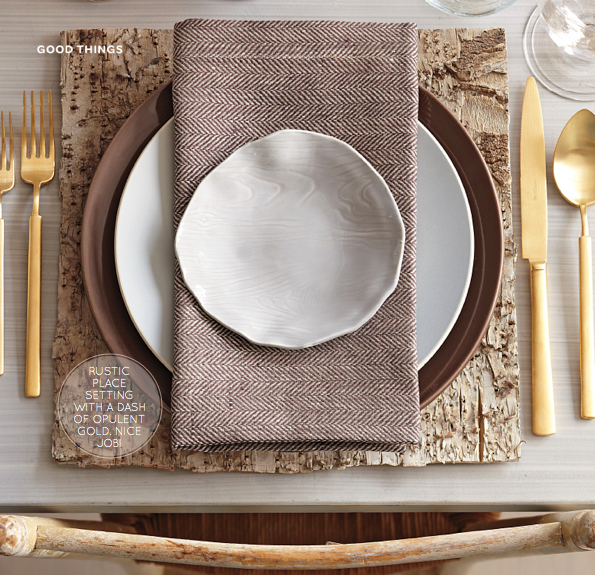 lol Oh and the brass looking flatware.... LOVEEEEEEE! She makes everything look so effortless!!!! Always great inspiration...from Martha and BB!! my favorite time of the year is autumn (oh, and the winter holidays! ), and martha does it so well. i just can't pick a favorite -- i love all of them! 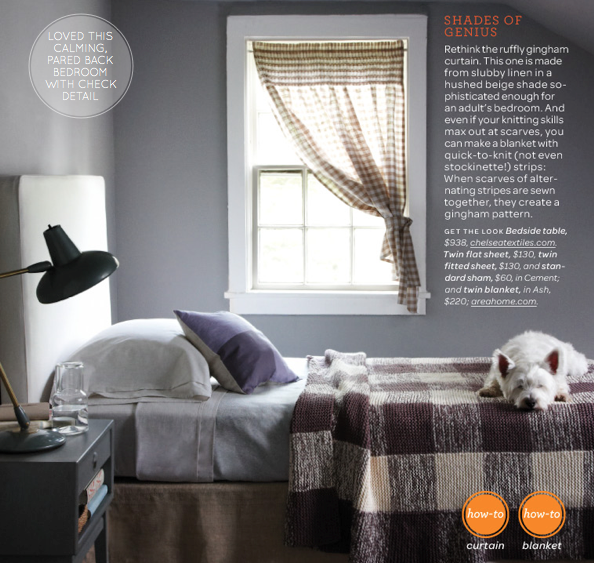 That wallpaper in the kid's room is adorable and hellllo gingham!! xo morgan! Martha Stewart -- so good with seasonal / holiday decor. All super cute. Love the colors. Makes fall look so cozy and fun! Great way to celebrate the seasons is by makign your space look cute like these! yeah read that on the plane coming back from a shoot, it was a good one, they have not been so hot lately. Love the gorgeous place setting and the fabulous entry! Beautiful inspirations as usual! Thanks so much for posting this - we are having a kiddies halloween/firework party at our house so im looking for easy recipes!! Love that apple wreath - wonder if i can pick up enough apples in the garden to make it!! 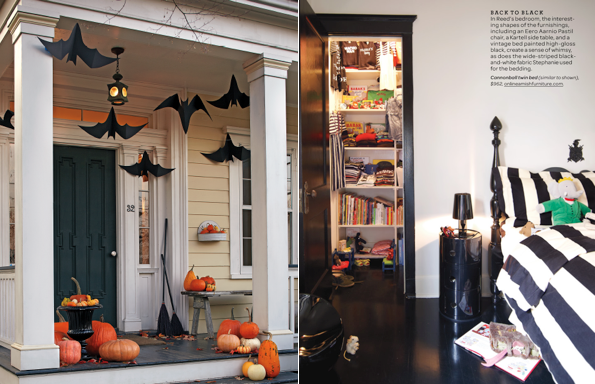 i love the halloween bit even though I m not much of a fan of the festivity as per se, beautiful ideas! @Nutmeg - I'm not sure, sorry. I can see why you like it though - it so fun!